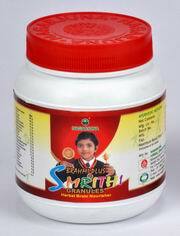 Improves all round brain functions like memory, grasping, intelligence, thinking, alertness, analytics and concentration. Brahmi, Mandookaparni, Vacha, Jyothishmathi, Katuki, Jatamansi, Chithrakam, Kushtam, Kethaki, Musali, Yashtimadhu, Sathavari, Aswagandha, Vidanga, Elam, Thvak, Nagkesar. Directions for Use: One tablespoonful twice daily.